I have been interested in the quirky sides of electronics for as long as I can remember, but I don’t know how Nixies evaded my eye for so long. Only during my first semester of college did I come across them. Such an awesome looking display, the 3D look to it and the glow of a tube-like device. Like many before me, I instantly decided that I needed to make a clock. The other day, I managed to come across a pile of electronics that were being dispose of and there was something I was looking for: a Nixie Tube based Volt Meter…. er, “Volt meter” is a bit misleading, it’s actually a milliVolt meter. It wouldn’t turn on at first, but a good whack to the tube board fixed that… no joke, it works a lot more often than it should. Now came the interesting part. I wanted to make a clock out of it, but not ruin the normal functionality. Normally with these projects a voltmeter like this is gutted and replaced with clock innards, or people just take out the tubes and their respective driver boards, but I wanted to be able to use this tool (never know if it’ll come in handy!). So, after a little thought and knowing I had some free time, I came up with this. Microcontroller with at least three PWM outputs, more if you need zero-correction control or if you need two pins for properly control minutes. 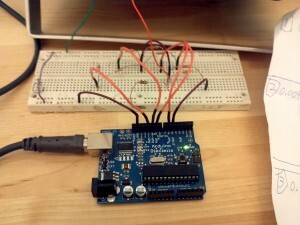 Arduino is a great board for beginners. Resistors matched to bring 5V to scale on the meter (while there are parts numbers listed here, please see notes farther down about how to calculate the ideal value and then why those aren’t used). 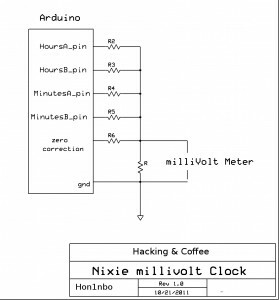 The clock operates by an Arduino** that keeps the time using the Time library, and outputs variable voltages via four/five (depends on mode) PWM pins. These are maxed out at 5V, and cannot operate at the milliVolt level the meter needs on their own, so I put each output through a Resistor Divider to compensate and tune it in. ** I have used this same arduino for an absurd number of things, I always can just pop it from one thing to another with a quick reprogram, but I want this running always so I am choosing a barebones uC and an actual RTC to keep things nice and smooth. Heck, I may even remake the circuit with all TTL gates since I am doing nothing better in required-before-taking-anything-else digital logic class right now. 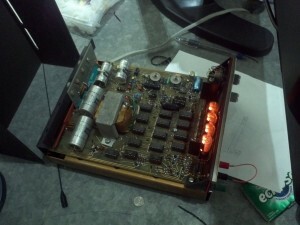 The day I picked up the meter, I went home and did the math for the voltage dividers. After a few tries (due to ADD on my part regarding the scale of the voltages being output, and then again since I switched to the 100mV scale rather than the 1000mV scale to take advantage of the decimal point placement), I had the set of resistors needed. However, some of the values either A could not exist (infinite decimals) or B, were too bizarre. So I rounded them down the closest value that was simple to implement, and then use some tweaking to determine the maximum PWM value to make the maximum output the divider should have, and all clock calculations are done accordingly. Turns out I didn’t need this, the zero is easy enough to adjust when switching from clock to meter modes. The Arduino Sketch is at the bottom of the page. The build was done on a breadboard for quick and easy tweaking, and since I wanted to get this working for a demo ASAP (ok, in reality because I’m still deciding on a different uC and will make a proper PCB rather than use perfboard, as I haven’t opened a bottle of Ferric Chloride in, quite literally, years. The clock worked after a lot of tweaking, but there are still a couple of quirks. First, there are points at which it will be running fast, and others where it is running slow, which is similar to the design of “Lord Vetinari’s Clock” which is meant to drive people mad. This will only drive you mad if you realize the minutes either change too ofter or too little, or if the least significant digit flickers between two values due to the presence of voltages below 0.01mV adding up (which it does… A LOT). As for general drift, it seems like I am getting quite a bit, but I shouldn’t be losing 9 minutes after an hour! – I have noticed that this old meter performs differently over time, maybe I should just let it run for a while and see how far off the tuning operations are when run. If they have gone off, the meter adjusted from temperature or long term operation. If they are the same, then my clock is drifting or programming wrong. So far my programming has tested right on everything, but I do know that the time library is also meant to grab time from serial. I am probably going to set this thing up with my spare network shield and pull from the universal clock for fun, I’ll check for more drift then. There also is the occasional value of minutes around 99, this is due to the resolution of the HOURS output, which if I turned it up one notch higher, would put it several mV above ideal. I figured I’d rather have closest to a number rather than only real numbers. (ex: if I set only valid values could be output, then assume the actual time is 2:00. If I output real values only, the error is larger and would show 2:03/4. 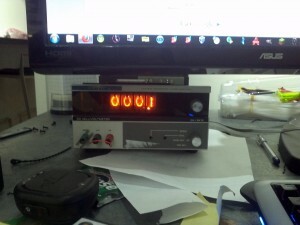 If I want more accuracy, then at 2:00 it may output 1:99 on some values. I’d rather have this as once it hits 2:01 it just shows up as 2:00 and not as far off. This only happens about every other hour. There is also a strange issue with the power supply arrangement. 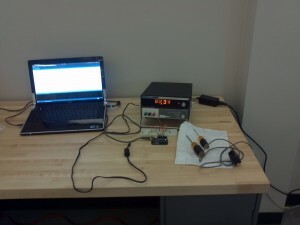 When setting up, programming, and tuning I used my computer as a power source for the arduino. When I tried to use a standard 5V adapter, I got a lot of absurd results that I could not successfully tune within the capabilities of my very short attention span. It may be that I damaged the voltage regulator on this board on another project (wouldn’t be the first time I’ve done that). I may evaluate this, but likely not as I want to try some other uCs I haven’t used yet and will build a board around it anyways. Input buttons to control it once it is no longer tethered to a computer, as right now the time is set by reprogramming it since I need the computer anyways. A selector to use different voltage dividers so that I can use the circuit on virtually any Voltmeter. Here is the Arduino Sketch (should work on all versions of the software, made particularly in 0018 since the machine I did this on has an old version since some libraries I use broke and I haven’t fixed them yet). Please do note, that if you try to make this yourself remember that all the values I have given will need to be tweaked for your setup, as when working in milliVolts things get a little more sensitive, for example I have multiple variable sets: one for power from a computer’s USB port, a set for operating on an external 5V adapter, and another that is needing to be written for operating on a USB Wall Wart.